Military strength, Harbor Class rotationally molded boats are available to customers looking for the most durable boat available today. Cross-Linked High Density Polyethylene double wall construction incorporating Widmer's patented "Kiss-offs" provides many advantages over wood, fiberglass, aluminum or steel hulls. This hull will not split, crack, dent, rot, corrode, sink or need maintenance. The material is non-slip, UV stable, abrasion resistant and puncture resilient. 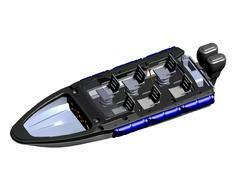 The hull absorbs violent wave impact energy reducing the G-force on occupants and gear. Originally designed as an Unmanned Surface Vehicle (USV) for the US Navy, a manned version is now available. 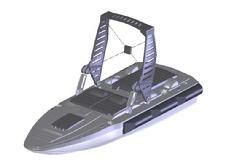 This is a 7 meter RIB replacement with inboard and outboard versions available. Click the boat photo of interest for complete outfitted pricing. Test drive the Flex Ride Night Raider today by calling 218-894-3466. Welcome GSA Users - The 7m Military Inboard Diesel/Jet is available here. "MILITARY PROVEN" Hull Design with the flexibility for custom outfitting, specific applications or mission configuration needs. 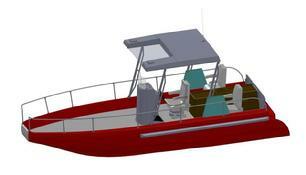 This 7 meter has a center helm, shock mitigating seats, twin outboards, 70 gallon fuel tank and several options. This is not your everyday pontoon boat. This 24 foot cruiser has a high performance catamaran planing hull sharing the same technology as the 7 meters above. It is powered by an inboard diesel with jet propulsion. Click the picture for a bottom view. This deck boat can be in 8 foot or 10 foot widths. 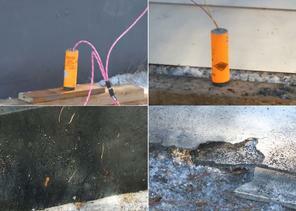 Inquire at 218-894-3466. Roto-molded Aircraft, UAV's and sUAS's. 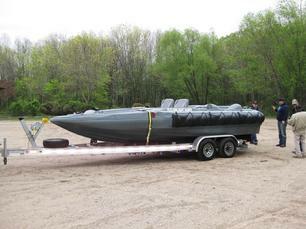 Flex-Ride Night Raider Plastic Boat: Explosives testing reveals energy absorbing superiority to FRP.